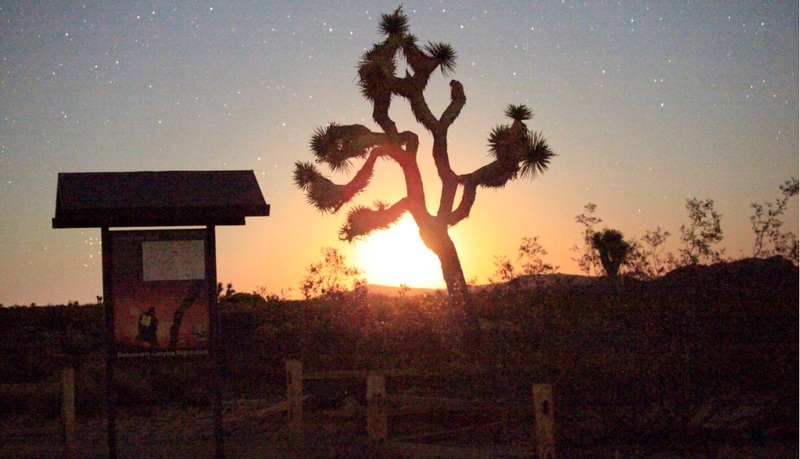 During the Aug 2014 CSETI Training in Joshua Tree, CA, I took the photos below just as the meditation was beginning. We had been directed by Dr. Greer to take photos during the meditation only if something important happened. Just as the meditation began, he indicated a bright golden object just above the horizon about 15 degrees in the east. Daniel D. stepped outside the circle and began recording with the night vision video camera. I checked internally and asked if I should take photos. The answer? Yes! I took 9 photos with the shutter open for 4 seconds for each one. After each exposure, the camera takes a few seconds to process the image. After processing I immediately took another photo. The golden ball moved to the south and I saw navigation lights, and so I decided it was a plane and there was no need to take further photos. When the meditation ended, I checked the photos and discovered this object on three of the photos. I did not see this object while taking the photos. I immediately reported the images to Dr. Greer and he invited everyone to come take a look. The group was on a snack/comfort break and so about half the people saw these images about 3 minutes after I saw them. There was a period of time of 15 seconds between photo 2 and 3, then a time difference of 18 seconds between slide 3 and 4. The final slide shows a 4 second exposure of a conventional plane with red and green navigational lights. Which begs the question: why does the military plane not have obvious navigation lights? 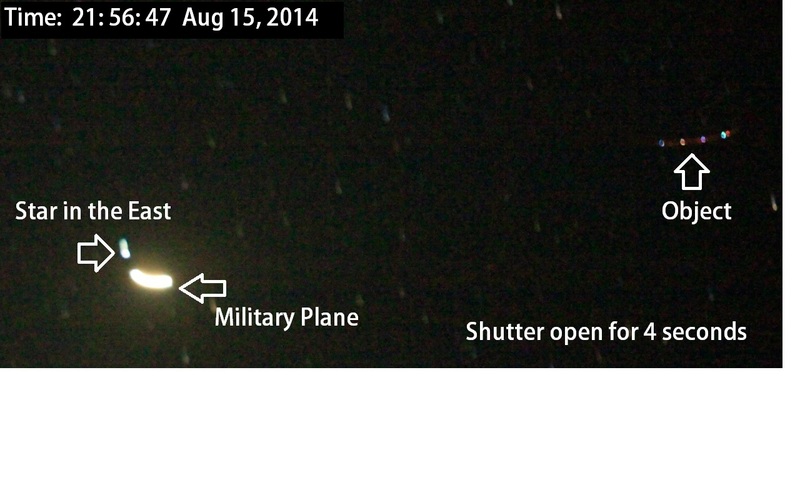 Why are the lights on this military plane so tiny (in photo #5)? 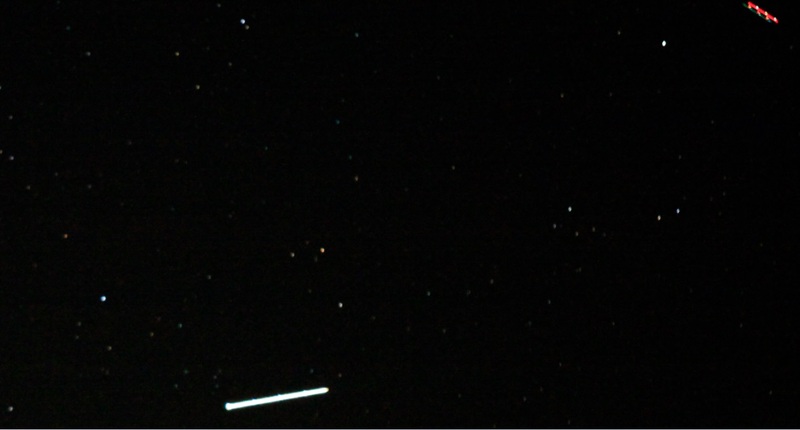 In my original high resolution images, if you look closely at the star positions between photo 3 and 4, you see that in 18 seconds the plane traveled to the right a certain distance, and in the same period, the object traveled to left 4 times the distance of the plane. The “thinning” of the object and dispersal of the ‘jewels’ of light may be some kind of preparation for a hyper-jump into a trans-dimensional form. The star is indicated as a reference point (it may be one of the stars in Pegasus). You can compare how fast and far the military plane is moving versus the object. Dr. Greer later explained that he remote viewed the plane and knew that it was a military craft surveilling the area for some reason — that is why he brought the plane to our attention. It may be one object (i.e. a single ‘jewel’) that is hyper-jumping 4 to 6 times while the shutter is open, that is the reason for the translucent red line. Or it could be one object (i.e. a string of ‘jewels’ on the exterior of the craft?) which appears in a circular arrangement in Photo 2 and then is demonstrating the hyper-jump configuration in Photo 3. All week, many people in the group were sighting red objects hovering briefly in the area. On the final evening (Aug 16th), just as Dr. Greer was beginning the Puja ceremony, I saw an object with this same appearance pop in briefly, it was about one inch at arm’s length at 20 degrees in the southeast sky. It is also interesting that in photo 2, there must have been some camera movement (I may have bumped the camera) because the stars, etc. are a little blurred but the object still appears very sharp. The sharpness of the image usually means that the object appears so quickly it cannot be perceived by the human eye. Also it may mean that ETs are interacting directly with the CCD of the camera (i.e. the electronic sensor that receives the image), and creating the image directly on the sensor. My camera? A Canon 5D Mark II with 200 mm lens. ISO set to 6400. Shutter open for 4 seconds. All week I had been asking the ETs for the opportunity to take pictures of “jewel-like” craft, just like the photos taken by Emery Smith (who appeared in the Sirius film documentary). Well?…. They look like jewels to me. A BIG thank you to the ETs for permitting this to happen! Many thanks to Dr. Greer for remote viewing the military craft. You are awesome sir! This experience was truly astonishing! CLOSE UP. The “blobs” in the middle of the lines, are lights that turn on and off. As you know I have the amazing privilege of a small, isolated beach place [which my wife & I share with another couple]. I sometimes go down there when I need alone-time, and I have had many opportunities to do meditation/CE V there. Other than stuff that I experienced with CSETI field events, the most intense experiences I have had in the past few years have been there when on my own. So, all four of us were there after Christmas and when that happens, the TV is always on and there’s lots of eating and talking etc….so on Sunday 29th December it wasn’t really conducive to quietly meditate into the right state of mind. Nevermind, during the day I had been reading articles about stress management and the two magazines had a common theme of “letting go”, and it seemed obvious to me that this is an area I could sure improve upon. About 10:15pm I decided to go outside and see if the weather had improved, as we had wind and a lot of cloud during the day. I was stunned – the sky was crisp, black velvet and the stars were sparkling. Orion was at about 50 deg in the east, and I could also see Taurus and the Pleiades. It seemed “special” [which probably means I could sense a presence], so I decided to go back inside and grab my laser and come back to connect. When I came back out I said a hello [triangles in the zenith, etc]. Then I started to relax and try and get into a better, peaceful state of mind. I recalled the magazine articles and formed the question: Is this what I need to work on? Immediately there was a flashbulb under Orion. That produced a sort of feedback loop where I became more joyful and focused, and I rearranged the question with some gratitude thrown in to my contacts. More flashbulbs. Then there were two “shooting stars” just left of the flashbulb position, one of which went UP…..[note that I saw no other activity of any sort, anywhere else the whole time while out]. At some point which I don’t remember clearly now, there was also a large [basketball sized? ], soft white orb which I caught in my peripheral vision [I am much better at catching these things now…]. I replayed it in my mind and looked in that direction, and worked out that it was close range, in front of the trees [If Emery had been there, I am sure he would have photographed it!]. There is a forest at the back of the section [and NO NEIGHBORS]. The grass was a bit wet and I didn’t follow up, but looking back I think I should have walked up there and gone [mentally] deeper. Even so I felt really good and thankful for such an off-the-cuff connection for which I didn’t even prepare. One other small thing, on January 2nd Julia and I went to visit a friend’s beach place on the opposite coast, about a 1 hr drive form our place. We went there for lunch, and while we were sitting under the shade cloth at the outdoor table under a blue sky, I saw a small “almost triangular” cloud out on its own. It wasn’t the cookie-cutter obvious sort of thing I have been lucky to see before, but it caught my attention and I started thinking about ET’s and connections. Straight away, three small holes developed inside this cloud….in a perfect isosceles/triangle formation! I smiled and acknowledged this but of course didn’t attempt to mention it to the others. I sometimes wonder if such things are self-created, since I am certain we all have such abilities. Though with past cloud events, I am also certain they were externally created. I think there’s a definite personal message [may not apply to other people] that I have to have a “genuine” reason or there is likely to be nothing obvious happening. It’s sort of like being “in tune” with the right type of intent. Sometimes if I have prepared properly, there is an exchange of greetings immediately – I start with a laser hello, and there’s an instant response [mostly a flashbulb but sometimes a zooming craft right from the laser triangle, so not some random meteor thing]. If I just go out and look at the stars, any visible stuff is rare – but say if I am driving home late and thinking about the right sort of consciousness-raising stuff, when I take a few minutes standing on the drive there is a connection. To be really frank, I get more when I am on my own and I haven’t figured out why. For episodes when negative people are present, the ET’s gave me very obvious lessons by turning up moments after those people left the event. But part of letting go, is not worrying about such things.